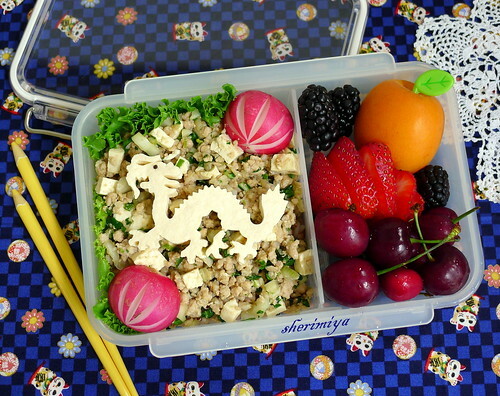 Mabo Tofu Dragon Bento, a photo by sherimiya ♥ on Flickr. Today's bento is ma bo tofu (recipe here), over mixed rice in a lettuce leaf. 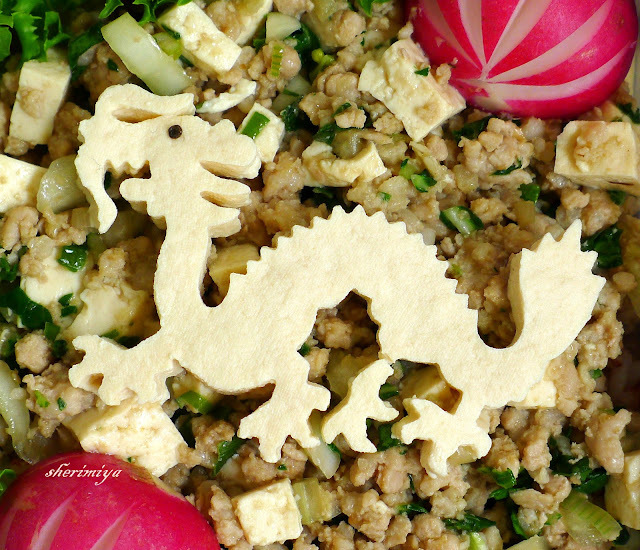 I attempted to cut a tofu dragon with my awesome cutter. I first cut a thin slab, about a half inch thick, of tofu the length of the cutter, then pressed. The cutter made a precise cut; the problem was removing the dragon in one piece. As you can see, I got most of it out pretty well, using the rounded end of a chopstick. The only problem was that one of the hind claws broke off. I simply replaced it on top of the meal, and it looks fine. I added a nori eye and some fancy cut radish halves, which kind of look like lanterns. This would make a nice celebratory bento, I think. I have now used this cutter on tofu, cheese and dragonfruit. It's very cool. The rest of the bento contains a variety of early summer fruit: apricot, blackberries, cherries and strawberry. By the way, Happy Little Bento got a mention at KoreAm Journal, and a short interview with me, in an article on the power of social media in bento box popularity. Take a look to see mentions of other bentomakers such as HapaBento, OhayoBento, Bentobird and Adventures In Bentomaking. Cute pics too! Is the tofu cooked Sheri? I really really love mabu tofu and must try to make it on my own.. with this dragon tofu, it just looks so much chic-er! Also, terrific article on KorAm! 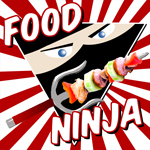 Too cool.. just saw a new bento blog new to me. Nope, it's "raw" tofu! You must try making this at home. I used Shirley's basic recipe although I omit the chili bean sauce for the kids (and to keep it gluten-free). It's delicious! Haha! I know, it's so cool, right? Thank you Ꮮуռ (ᶬˠ ᶩᶤᵗᵗᶥᵋ ᵐᵋˢˢᵞ ᴻ ᶜʱᵋᵋᵏᵞ)! where did you buy your dragon cutter? Is so cute and the lunch look so yummy! although it appears they are currently sold out. Stylish, gorgeous and sweetly abundant bento--sigh of delight :)! Thank you Lily dear! We are definitely missing your exquisite bento recently, and so happy to see the new Pikachu one!